Alien Cyborgs: I’ve seen artists that do all manner of geekery: Graffiti, Animation, 3D, Painting, Illustration…but you do something a little different. Can you tell us what it is you do and what medium you work with? 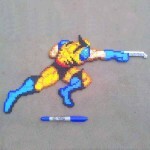 Adam Heiney: I mainly work with Perler Beads®. 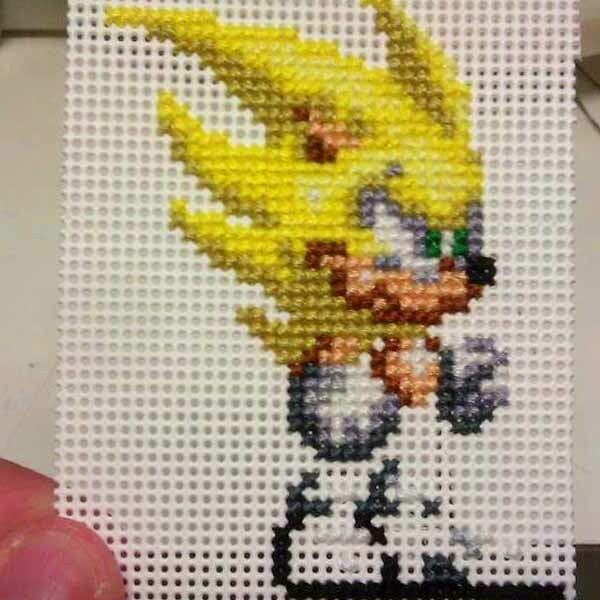 They’re a craft toy you might’ve played with as a kid. 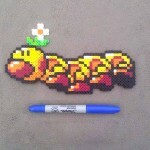 Perler Beads® are little plastic cylinders you place down in whatever pattern and then iron them together. With these I make any and all things from retro video games. 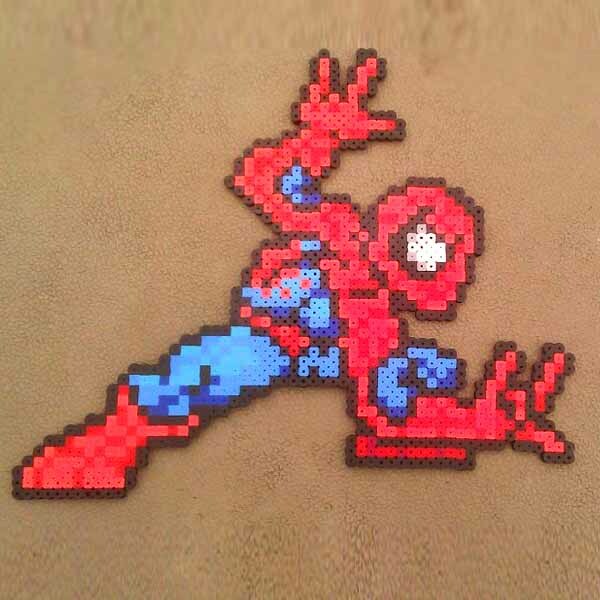 Anything from the 80s and 90s of gaming to even modern games made with that retro, pixilated style. 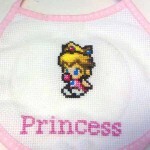 I also do make smaller video game objects by cross stitching with embroidery floss on plastic canvas. Alien Cyborgs: Wow..thats awesome. 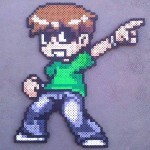 I really like your work and my brother MR77 (MegaRam77) loves your Mega Man stuff. 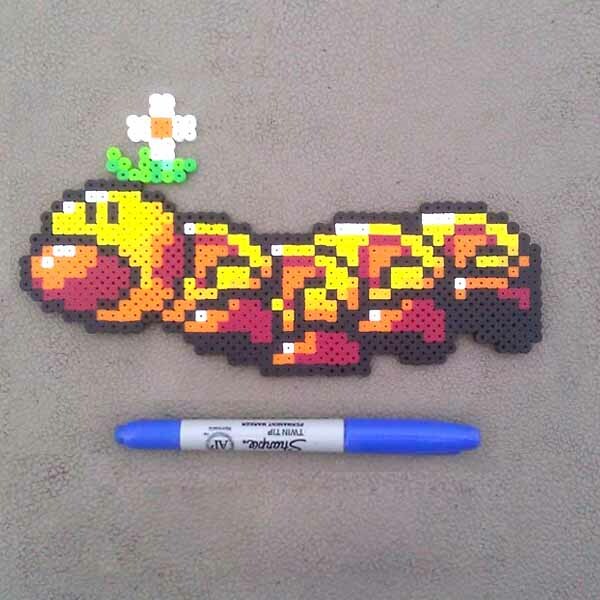 The beads really add to the very distinct look of 8-bit that is indicative of Retro Games. 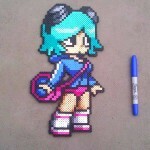 What do people usually do with your artwork? Do they sew your work on as patches? Do they turn them into wearable art? Personally, I would use your art work to decorate the coolest Christmas Tree ever! 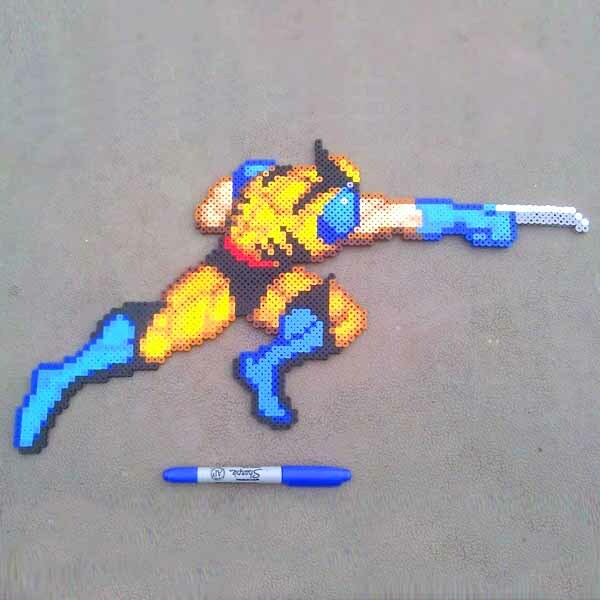 Alien Cyborgs: How did you land on Perler Beads®? What made you think about using them in such a Geeky way? 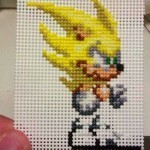 Adam Heiney: Well, believe it or not I actually started doing pixel art on graph paper, combining shades of colored pencil to get just the right color, until one day I saw a sprite of Paladin Cecil from Final Fantasy IV in the community section of an issue of Nintendo Power, it was made out of beads and I thought, “…that’s so awesome to be able to physically hold a character I used to see on my T.V. screen when I was little and played Super Nintendo.” Although it actually took me a bit to get around to making Paladin Cecil because I didn’t have the right colors at first. 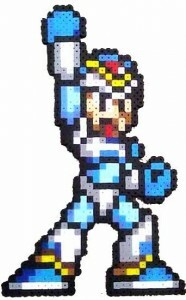 My very first sprite (which is still hanging on my wall) is 8-bit Mega Man…MR77 oughta like that one! 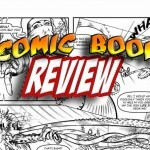 Alien Cyborgs: So is it safe to assume that you read comic books and play video games? 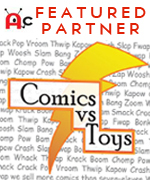 Adam Heiney: I do read the occasional comic book. I’m not real big into “The Big 2” (DC and Marvel) I more or less just read comics of universes I’m already into, such as Dark Horse’s Star Wars comics and the Mega Man comics. 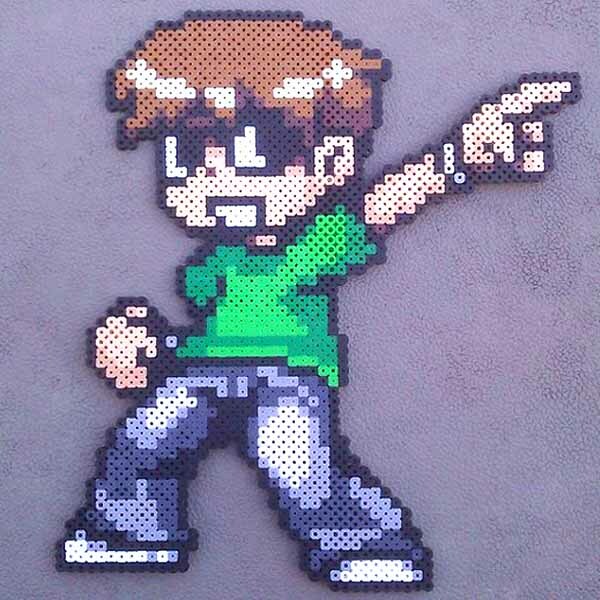 And yes, I play video games, I wouldn’t be so passionate about making Perler Art if I didn’t. I’ve been playing video games probably since I was 5 years old or so, as long as I can remember…[I remember] sitting with my dad watching him play Populous and Legend of Zelda and all the Mario Bros. games. Alien Cyborgs: Is it safe to say that you’re a bit of a Geek then? Adam Heiney: Yeah, I definitely “Speak out with my geek out” on a daily basis. 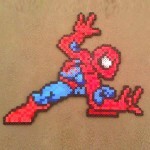 Perler Beads® the building blocks of cool! Alien Cyborgs: <Laughs> Nice plug bro, thanks! 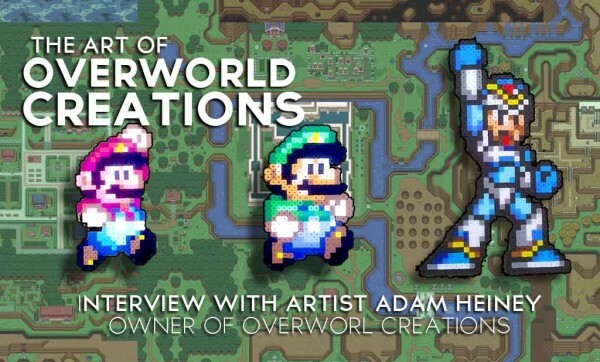 Speaking of plugs, please tell us a bit about your business “Overworld Creations”. When did you start? Alien Cyborgs: Ahhh….hence the name! Nice! Adam Heiney: Yep! 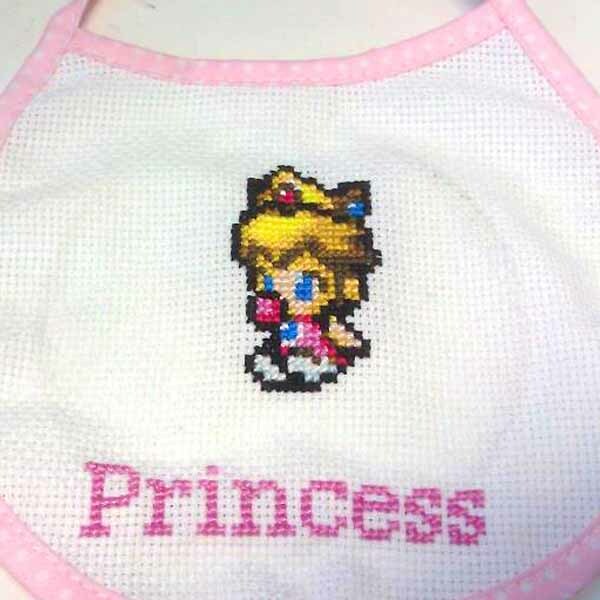 As far as the business side of things..I have an Etsy Store that I usually keep stocked with at least 10 to 15 items for sale, I can also take custom orders any way you can get a hold of me and take payments via paypal. 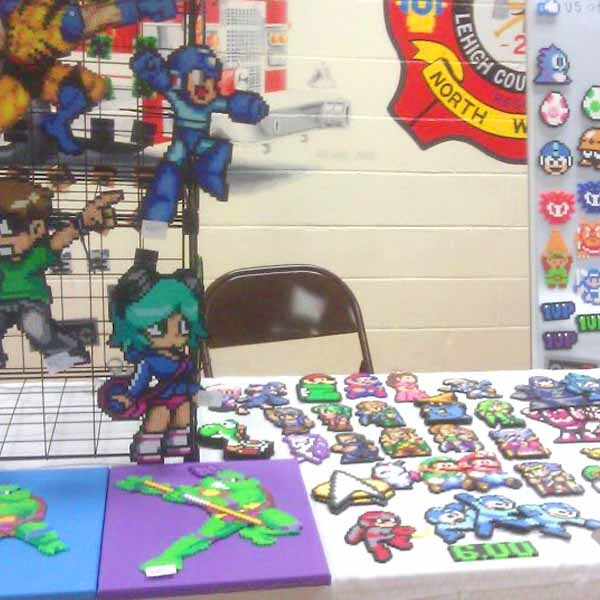 Also I’ve begun going to local comic book/anime/gaming conventions and setting up a table of my wares. Alien Cyborgs: So, you do commissioned work as well? Adam Heiney: Oh, I love commissioned work. When I first started this as a hobby one of my biggest issues was simply thinking of WHAT to make, because the possibilities are nearly limitless. Alien Cyborgs: Do you like to show at conventions? What Cons have you shown at? Alien Cyborgs: Nice! How did it go? Alien Cyborgs: Well, done sir! As long as you’re getting your name out there…that is a Great Start! I hope they gave you a crazy shout out on the Vidcast. What are some of your favorite projects that you have created?! 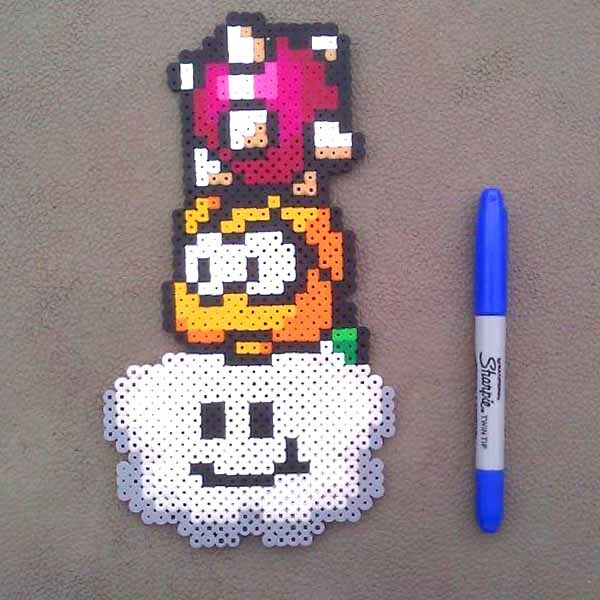 Adam Heiney: Favorite projects..well, I always enjoy making robot masters from the original Mega Man games so those’re some of my favorite sprites I’ve made. I also made a quite large Princess Peach for my girlfriend, it’s maybe 15 inches tall. Not that I don’t get enjoyment out of making sprites for people’s commissions, but the ones I enjoy the most are the ones that let me reminisce about being a child and sitting in front of the NES or SNES for hours on end… Legend of Zelda sprites, Final Fantasy sprites, the big names. Alien Cyborgs: Sweet…What is in the future of Otherworld Creations? Adam Heiney: More conventions! I’m looking into one in Bridgewater, NJ as well as a fairly large convention in Philadelphia in September. 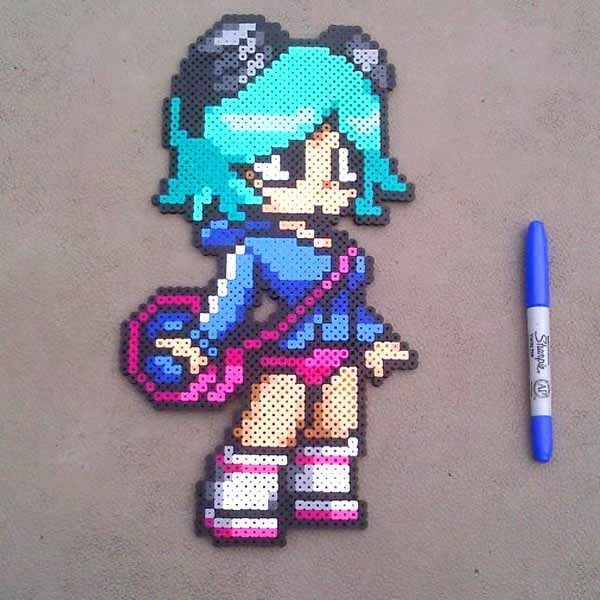 It’ll be more geared toward my target audience… a convention called Retro Con. 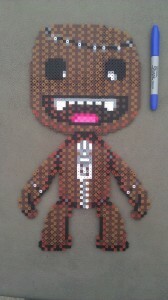 All you need are a few beads and a lot of talent. Alien Cyborgs: I know that Con, they post some really great stuff on their FB Page. I love your artwork, I think its so cool that your art work is a PHYSICAL thing. It is very cool to be able to hold artwork in your hand as opposed to just staring at it on a monitor or hung up on a wall. 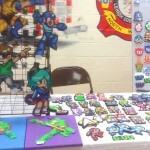 I know fellow admin MR77 would LOVE your Megaman stuff. Man, I wanna wish you luck and I know you’re going to sell a bunch of your art. Adam Heiney: I hope so! 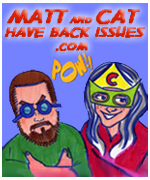 Alien Cyborgs: Thanks for letting us feature you our humble lil’ site!